For the best prices, discounts and options on mattresses in the San Diego area, browse our guide below. With a bustling population and a health-conscious mindset, San Diego has a big market for mattresses of every type, and a huge number of mattress shops to meet that need. Many shoppers here want a specialized mattress to correct back pain or improve wellness through more restful sleep. Others in this eco-conscious city want a natural mattress or a store that offers mattress recycling. And, of course, a great many customers are simply looking to save money by finding the most affordable mattress in town. 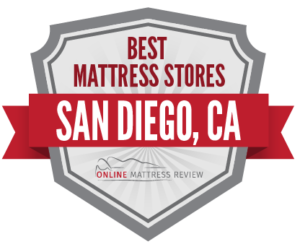 We’ve explored all 64 mattress stores in San Diego to bring you the best of the best by special and location. If you’re wondering where to buy a mattress in San Diego, read on to discover the best option in your neighborhood. The mattress store in San Diego with the most centrally located showroom is Mattress Firm, which has mattress shops in Westfield Mission Valley (1660 Camino De La Reina) and Mission Valley East (2401 Fenton Pkwy). This national chain consistently delivers a wide selection of affordable mattresses from name-brand companies. Real Deal Mattress (7636 Clairemont Mesa Blvd) is the mattress store in central San Diego with the highest number of positive reviews. Customers report outstanding customer service, with the owner personally providing guidance and assistance. This mattress shop also boasts a huge selection of specialty mattresses, such as memory foam, adjustable and hybrid beds, with excellent prices on high-end products. Just two blocks away, another mattress shop in the Kearney Mesa neighborhood that’s worth a look is Mattress Sale Liquidators (7377 Convoy Ct). As the name implies, this store specializes in affordable mattresses, with savings of up to 70% off retail value. In the same neighborhood, you’ll also find another location of Mattress Firm (4160 Kearny Mesa Rd). With so many mattress stores clustered in the Kearney Mesa neighborhood, customers can do some convenient comparison shopping to score the best deal. Miramar is the neighborhood to head to when looking to buy a mattress in San Diego north of the city center. On and around Miramar Road are clustered no less than ten mattress stores, and shoppers can find great deals or meet specific needs by investing the time to compare products and prices between stores. Several of these mattress stores even match competitors’ prices. Ortho Mattress (7920 Miramar Rd) is one such store. This mattress shop specializes in Tempurpedic and other high-end or specialty mattresses, which they manufacture themselves. Comfort-Pedic (6906 Miramar Rd) is another mattress store that’s popular with customers in search of specialty mattresses, especially those with back pain, sleep apnea and other forms of sleep discomfort. About a mile away, the mattress shop in north San Diego with the highest customer ratings is Mattress Makers (7919 Silverton Ave). This innovative mattress store sells modular, customizable mattresses, which are assembled in layers and sealed with zippers to allow reconfiguration. Mattress Makers also offers a 10-year “love your mattress” guarantee, and recycles old mattresses or donates them to an orphanage in Mexico. There’s even a kids’ area in their stylish showroom with toys and Netflix, so parents can take their time to shop. The most unconventional and innovative mattress store in South San Diego is certainly Sleep Bedder (2855 El Cajon Blvd), a blend of mattress shop, eco boutique and community art space. The showroom is chic and eclectic, with local art, plants, white walls and exposed good beans creating a lush and sophisticated space. Shoppers can sip complimentary tea and coffee, while choosing a high-end, natural or eco-friendly mattress. Stick around for a community event; this mattress shop hosts yoga, kombucha workshops, local art markets, acupuncture and more. If, on the other hand, you’re after a bargain, try Budget Furniture Outlet (1050 Highland Ave), is a small, locally-owned furniture and mattress store with a big inventory and personal service. The owner will match or beat any price, making this a great choice for shoppers in search of the most affordable mattress. Mattress Store San Diego (707 L St) has earned an incredible 259 5-star reviews on Yelp. Customers gush about incredible personal service from the owner, and incredibly affordable mattresses, as well as innovative bedding items, like Z-zoned memory foam pillows infused with lavender oil. A Bedder Buy (5058 El Cajon Blvd) is a great source for affordable mattresses and furniture. The owner of this small family business is known for friendly service and for making deals with customers purchasing sets of furniture and mattresses together. If you’re considering a futon for your guests or dorm room, Futon John (4135 Poplar St) is a well-reviewed mattress store in East San Diego. This family-owned mattress shop has been selling American-made futons for over 45 years. The store makes just one product: trifold futons in sing and double sizes, but customers love the high quality and low prices at this specialty store. Don’t let the name fool you- the Futon Shop (7470 Girard Ave) sells more than futons. This well-reviewed mattress shop in La Jolla sells natural, organic and chemical-free mattresses and furniture in a range of styles. Here, customers can find mattresses made from alternative materials such as wool, latex and even coconut fiber. If, on the other hand, you’re looking for a wide selection of traditional, name-brand mattresses, there’s Mattress Firm Midway District (3146 Sports Arena Blvd) and, right nearby, Mattress Firm Sports Arena (3109 Sports Arena Blvd).